Aas, Mart. 2013. Äralennuväli. [The Emigration Airport.] Manuscript at the Estonian Theatre Agency. Adorno, Theodor. 1997. “Cultural Criticism and Society.” In Prisms. Translated by Samuel and Shierry Weber. Cambridge, 17–34. Adorno, Theodor. 2006. The Culture Industry: Selected Essays on Mass Culture. London, New York: Routledge. Adorno, Theodor; Max Horkheimer. 2016. Dialectic of Enlightenment. London: Verso. Anderson, Benedict. 2006. Imagined Communities: Reflections on the Origin and Spread of Nationalism. London, New York: Verso. Annus, Epp. 2018. “Aesthetic Sovietness: Vestigial Soviet-Era Landscapes in the Context of Estonia’s High-Tech Dreams.” International conference Contested Bodies: Identities and Spaces in the Post-Soviet Territories, University of Pennsylvania, Philadelphia, 15.–16.3.2018. Augé, Marc. 1995. Non-Places. Introduction to an Anthropology of Supermodernity. Translated by John Howe. London, New York: Verso. Balme, Christopher B. 2014. The Theatrical Public Sphere. UK: Cambridge University Press. “E-governance.” E-Estonia web page. www.e-estonia.com/solutions/e-governance/state-eservices-portal (1.5.2018). Einasto, Rein. 2017. “Mahe-Eestist rahvusriikluseni. Inimkesksusest ökosüsteemsuseni. Mõtisklusi.” [From Organic Estonia to a nation state. From human-centredness to the ecosystems. Reflections.] Akadeemia, 7, 1155–1171. Epner, Luule. 2005. “Redefining national identity by playing with classics.” Sign System Studies, 33 (2), 379–404. Eslas, Urve. 2007. “Sina! Tee lapsi!” [You! Make babies!] Postimees, 14.5. arvamus.postimees.ee/1660501/urve-eslas-sina-tee-lapsi (1.5.2018). Estonian Human Development Report 2016/2017: Estonia at the Age of Migration. Cooperation Assembly Foundation. www.inimareng.ee/en (1.5.2018). Gombrowicz, Witold. 1998. Päevaraamat. [Diary.] Translated by Hendrik Lindepuu. Vagabund, 126–127. Habermas, Jürgen. 1990. Strukturwandel der Öffentlichkeit: Untersuchungen zu einer Kategorie der bürgerlichen Gesellschaft. Mit einem Vorwort zur Neuauflage. Suhrkamp. Hot Estonian Guys by Theatre NO99. no99.ee/productions/no88-gep-hot-estonian-guys (1.5.2018). Hutchinson, John; Smith, Anthony D. (eds). 2012. Nationalism. Oxford, New York: Oxford University Press. Invest in Estonia. investinestonia.com/estonia-the-worlds-first-organic-country (1.5.2018). “Kaljulaid, President’s Office to relocate to Narva for one month next fall.” ERR News, 28.12.2017. news.err.ee/651082/kaljulaid-president-s-office-to-relocate-to-narva-for-one-month-next-fall (1.8.2018). Kase, Kajar. 2009. “Jänes jäi jänese-tükiga rahule.” [The Hare was satisfied with the hare-piece.] Postimees, 26.3. kultuur.postimees.ee/99246/janes-jai-janese-tukiga-rahule (1.5.2018). University Audentes, 67–94. www.ies.ee/iesp/No4/Kirch_Tuisk.pdf (1.8.2018). rajad: muutuste kaks aastakümmet. Tallinn: Eesti Koostöö Kogu, 192–200. kogu.ee/public/eia2011/EIA_2011.pdf (1.5.2018). Lehmann, Hans-Thies. 2006. Postdramatic Theatre. Translated and with an introduction by Karen Jürs-Munby. London, New York: Routledge. Lehmann, Hans-Thies. 2007. “Theatre After Theatre.” In Na(ar) Het Theater – After Theatre? Supplements to the International Conference on Postdramatic Theatre. Edited by Marijke Hoogenboom. Amsterdam School of the Arts Research Group, 47–55. Linder, Eva-Liisa. 2013. 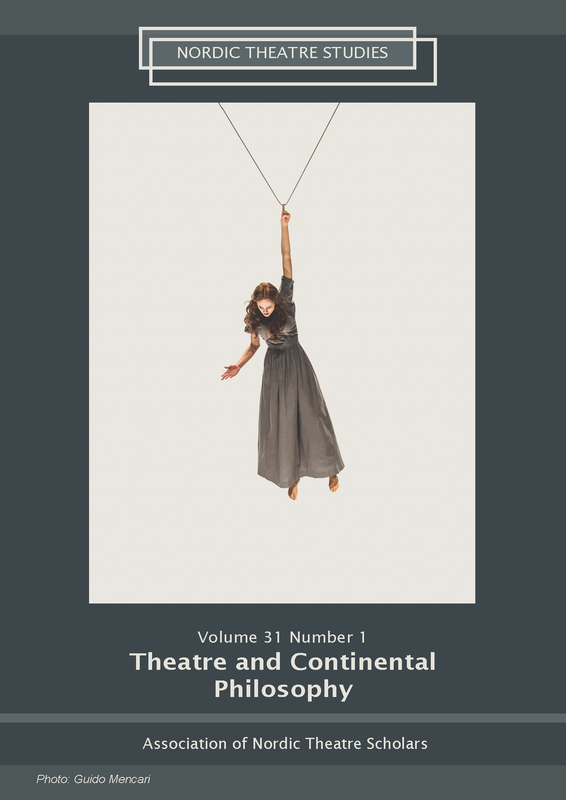 “How Theatre Can Develop Democracy.” Nordic Theatre Studies, 25, 84–96. Mets, Laura. 2016. Interview 16.3. Interviewed by Eva-Liisa Linder. The personal archive of Eva-Liisa Linder. O’Connor, Kevin. 2003. The History of the Baltic States. Connecticut, London: Greenwood Press. Pesti, Madli. 2012. “Theatre Performance or Political Party?” Dialogi, 5–6. Pilv, Aare. 2019. “Mis on NO99 moraal?” [What is the morality of NO99?] ERR Kultuur, 19.1. kultuur.err.ee/899991/aare-pilv-mis-on-no99-moraal (1.3.2019). Põld, Anna. 2018. “Madison peab NO99 sulgemist konservatiivide töövõiduks.” [Madison considers the closing of NO99 as an achievement of the conservatives.] Postimees, 31.10. www. Reidolv, Kristiina. 2018. “Theatre in Border Areas.” Theatre and Migration, IFTR World Congress, Belgrade, 11.7.2018. “Rein Lang: Teatrietenduse katkestamise süüdistus on laimukampaania!” [Rein Lang: The accusations in interrupting the performance are a smear campaign.] Eesti Ekspress, 26.3.2010. www.ekspress.delfi.ee/kuum/rein-lang-teatrietenduse-katkestamise-suudistus-onlaimukampaania? id=30042419 (1.5.2018). “Rein Lang.“ Radar, 16.5.2015. www.youtube.com/watch?v=u7fydIbBzWo (1.5.2018). Reinelt, Janelle. 2005. “National Signs: Estonian Identity in Performance.” Sign System Studies, 33(2), 369–378. Reinelt, Janelle. 2011. “Rethinking the Public Sphere for a Global Age.” Performance Research, 16 (2), 16–27. Rähesoo, Jaak. 2008. Estonian Theatre. Third Edition, Revised. Tallinn: Estonian Theatre Union. Smith, Anthony D. 1991. National Identity. Reno, Las Vegas: University of Nevada Press. Stephens, Simon. 2011. “Hüpata pimesi taevast alla ehk viis asja, mida ma olen õppinud Sebastian Nüblingilt.” [To jump out of the window or five things I have learned from Sebastian Nübling.] Translated by Eero Epner. Sirp, 5.8. vana.no99.ee/tekstid.php?event_id=62∋d=164 (1.5.2018). Theatre NO99. 2018. “We finish.” Theatre NO99, 31.10. no99.ee/en (31.10.2018). “Ühtne Eesti Suurkogu.” Unified Estonia Assembly video recording by Theatre NO99, 12.9.2013.